Who doesn't love a good redemption story? A wronged athlete returning to his erstwhile stomping ground to face his old team and proving a point with a blitzkrieg of points is what makes a great sports story, right? Chances are, if you're a Los Angeles Clippers fan, you probably have noncommittal answers to both those questions. For, on Sunday, the Clippers fans were at the receiving end of Blake Griffin's tale of redemption. Griffin, as you will recall, used to play for the Clippers, where he was starting to become a marquee player. But then, the Clippers traded him to the Detroit Pistons last season, in a complex trade which involved Brice Johnson and Willie Reed moving to Detroit along with Griffin while Tobias Harris, Avery Bradley, Boban Marjanovic, a 2018 first-round draft pick and a 2019 second-round draft pick went the other way. It seems like Griffin never quite moved on from that 'betrayal' –he gave seven seasons to the franchise and reports before the match pointed out that Clippers coach Doc Rivers and Griffin had never spoken since the trade. And he showed how eager he was to get payback on his former team when his side came calling at the Staples Centre on Sunday. 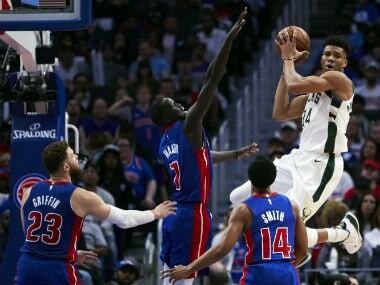 With Griffin's 44 points and eight rebounds, the Detroit franchise flew back with a 109-104 victory. But what happened before the game was even more notable than what happened after tip-off. Clippers owner Steve Ballmer was courtside during the Pistons' warm-up session. As Griffin was walking off the court, Ballmer approached him with an outstretched hand, only for his former employee to trot away from him. One being asked about the snub, Griffin said: "For nine years now, as soon as I'm done with my pregame shooting, I make sure there's a path and I take off running to the locker room. I don't stop running. A lot of you know that. A lot of you have been here for a long time and seen me do that before. I don't change that for anybody." What, however, raised a few eyebrows in the aftermath was Griffin liking a video on Twitter encapsulating the incident. While on the subject of testy relationships, it appears things are not quite hunky dory in the Boston Celtics locker room. 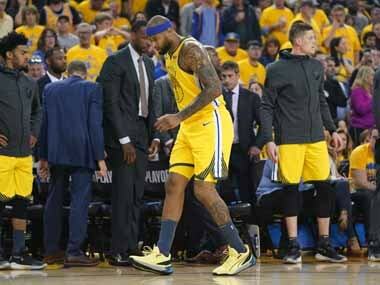 On Sunday, their clash against Orlando Magic brought a moment of frustration from superstar Kyrie Irving that was reminiscent of Golden State Warriors' Kevin Durant getting livid at teammate Draymond Green on the court earlier this season or LeBron James' frustration at JR Smith messing up a critical shot in the dying seconds of last season's NBA Finals. The trigger for Irving's anger was similar: a teammate, in this case Gordon Hayward, had not passed the ball to him with the game on the line – the Celtics were trailing by two with 2.9 seconds left on the clock – and had instead chosen to move it to a youngster (Jayson Taytum), who missed! Irving was seen remonstrating with Hayward in the aftermath of the game. After the game, Irving, belonging to the first section, told reporters: "We're lacking experience, and because of that, we have a lot of learning to do." 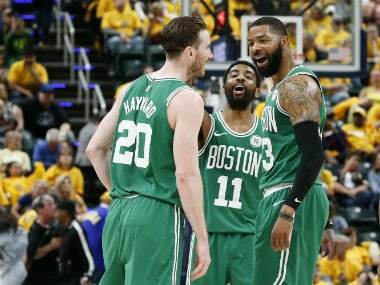 When someone pointed out that the team had made it to the Eastern Conference Finals (that too with Hayward more or less missing the entire season), he said: "We had nothing to lose last year. Nobody had any expectations... We come into this season with expectations, and it's real... That's new, it's tough and it's hard." He went on to add: "What we're facing now is nothing compared to being on that stage, trying to get a gold trophy. It's hard now. What do you think it's going to be when we get to the Finals? We can't be comfortable being a fifth (seed). I'm not comfortable with it." Irving was also seen disputing a call by coach Brad Stevens during the game. These two incidents add fuel to the fire that not all is well in the dressing room, a rumour that first started a few days ago when footage surfaced of Jaylen Brown and Marcus Morris needing to be separated during a timeout. 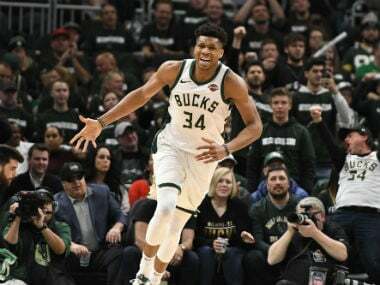 Meanwhile, the Milwaukee Bucks' game against Houston Rockets featured this extraordinary assassination attempt/mis-thrown pass from Giannis Antetokounmpo to James Harden. It has been that sort of a week. Here's Jarrett Allen passing to Kenneth Faried, who was not even playing. The Nets have 18 turnovers. Speaking of Jarrett Allen, this spectacularly shanked dunk from him, which turned out to be an assist (we think!) was… well, spectacular! Hang on, how's this javelin throw of a pass for an assist from Nikola Jokic?